When the Death trump is pulled fear of disease and loss rises to the surface for the uninitiated. Misfortune is assumed. The more one stands to lose, the scarier Death seems. Those “on the bottom” tend to pray for or are indifferent to Death where the fortunate and successful tend to seek immortality in life or legacy. Death is the great neutralizer. 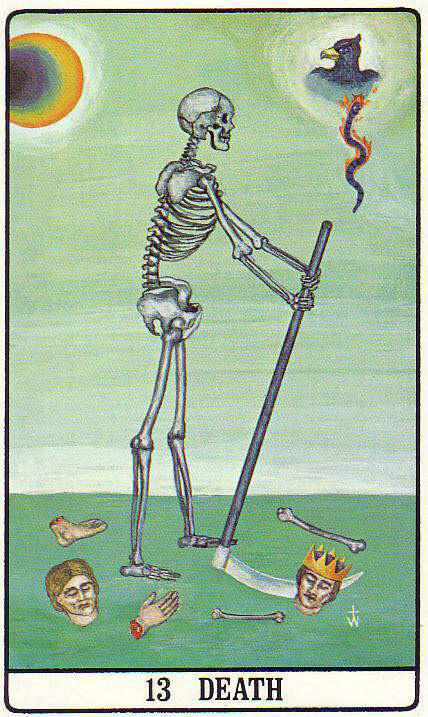 The Death card corresponds to Pluto. Pluto is the guardian of Scorpio which is a water sign and symbolizes power through alchemy. Death relates to transformation but that alone is a limited concept of Death. Everything in Nature is born and dies. No exceptions. Everything exists in seasons. Autumn being the season of Death and Scorpio. We acknowledge the harvest that was not had as much as it was bountiful. This cultivates a sense of humility and gratitude. To reference the introductory quote, to avoid taking stock of what is your reality, one will manifest subconscious fears. Death is a Surrender to Nature. Nature can be primal, chaotic, unknown. Paired with the Tower or Devil trumps, Death can signify a hidden part of yourself making itself known to be integrated and alchemized. For instance, if one is very successful but drinks heavily to mask a trauma, with those three cards, I would guess that the drinking will sabotage the querent so dramatically that his life will forever change. Perhaps, the querent has to go to prison or rehab or get divorced or file for bankruptcy before confronting the trauma. But Death can be a positive. Say Death was paired with the Sun and the Lovers reversed. A much needed breakup can allow and manifest a new confidence, pride and life path in the querent. A little gardening can work wonders. Death does not have to be physical, either. It can be the death of a self-narrative. You release victim-consciousness or grief. You mature and grow and experience new patterns and behaviors. In short, Death is an invitation, an initiation. It is not the end or a transformation. It is a new dimension of life’s journey. Go up or down; cerebral or primal; allowing or rejecting. Enter the portal or continue the delusion. Go down the rabbit hole. What is the worst that can happen?